Feminized auto flowering marijuana seeds are the perfect choice for growing your own marijuana outdoors. Both new and experienced growers can produce their own, high quality buds quickly and cheaply, with very little effort or experience needed. Stable, reliable and very easy to cultivate, feminized auto flowering marijuana seeds are quick to grow, flower and mature, generating a high quality harvest in the shortest time possible. All of our recommended feminized auto flowering marijuana seeds for sale are guaranteed to germinate, producing a stable and vibrant female plant. Devoid of any male chromosomes, each seed will grow, flower and quickly mature, producing fast, generous harvests of high quality buds. Feminized marijuana seeds have become the most popular choice for both commercial and ‘hobby’ growers, providing the best returns per seed. With each seed producing a high quality female plant, and without the need for sexing, buying feminized marijuana seeds guarantees each plant is a pure female, capable of producing buds and cola’s for harvesting. As with traditional feminized seeds, all our recommended feminized auto flowering marijuana seeds are guaranteed to produce pure, female-only plants. The main difference between the two being the way in which they flower and mature. While conventional marijuana plants require a reduction in daylight hours to commence flowering, auto seeds mature with age, requiring no reduction or set hours of darkness to flower and completely mature. 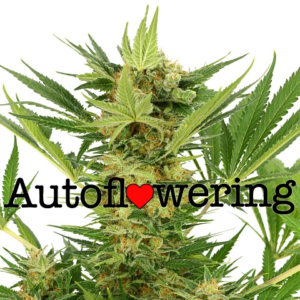 This auto flowering characteristic has huge benefits for many growers. New or inexperienced growers no longer have to worry about sexing the plants, as they are all completely female, and due to their auto flowering abilities, do not have to wait for the daylight hours to reduce to induce flowering. Outdoor growers planting feminized auto flowering marijuana seeds at the start of the season will not have to wait until early Fall to enjoy their harvests. Once germinated and sprouted, the plants begin to grow and flower simultaneously, with the majority of auto flowering strains completely mature within two months. Because of their reduced vegetative period, feminized auto flowering marijuana seeds do not achieve the size or yields that conventional feminized seeds can achieve. However, their smaller stature makes them far easier to conceal and disguise, a perfect choice for guerrilla growers, and those people not wishing to attract too much attention. 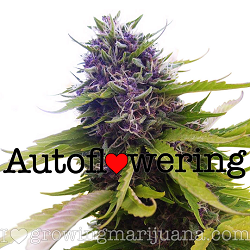 Unlike traditional seeds, auto flowering seeds can be planted outdoors to produce several harvests per year. With young seedlings requiring an average of just sixty days to completely grow, flower and mature, several feminized auto flowering marijuana seeds can be planted in the same space over the course of a season, especially if you have the next generation already germinated to plant outdoors as the previous plants are ready to be harvested. All our recommended feminized auto flowering marijuana seeds are created using the finest, most stable genetics, generating plants that will automatically flower regardless of the number of hours of darkness they receive. The fastest and easiest way to grow a high quality, outdoor crop, producing buds and cola’s with the same flavor, aroma and effects as their traditional feminized counter-parts. Compact, bushy plant, easy to grow with a skunk and pine aroma. THC content 20%. CBD level – Medium. Flowering Time 56 days. Yield – 120 grams per square meter. Large yields of potent, dense buds in a super-fast time. THC content 18%. CBD level – Medium. Flowering Time 58 days. Yield – 210 grams per square meter. Buy Amnesia Haze Feminized Auto Flowering Marijuana Seeds. Fast and easy to grow, producing small, dense plants and fruity flavored buds. THC content 14%. CBD level – Medium. Flowering Time 56 days. Yield – 160 grams per square meter. Buy Blueberry Feminized Auto Flowering Marijuana Seeds. Large buds with a sweet flavor and long-lasting high. THC content 17%. CBD level – Medium. Flowering Time 56 days. Yield – 155 grams per square meter. 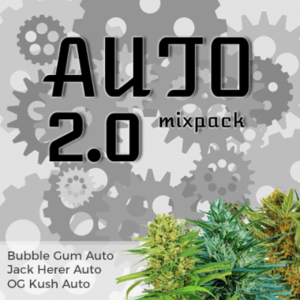 Buy Bubblegum Feminized Auto Flowering Marijuana Seeds. Medical variety with all the traits of the original variety, but easier to grow. Buy Jack Herer Feminized Auto Flowering Marijuana Seeds. Small and discreet, very easy to disguise, producing a large, central cola. THC content 14%. CBD level – High. Flowering Time 58 days. Yield – 90 grams per square meter. 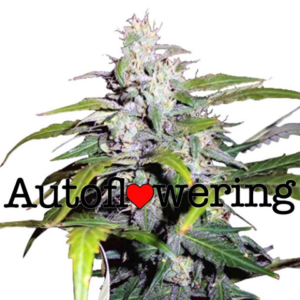 Buy Lowryder Feminized Auto Flowering Marijuana Seeds. Dense, colorful buds with a powerful, long-lasting high. Buy Northern Lights Feminized Auto Flowering Marijuana Seeds. Easy to grow version of the classic strain, with it’s unique flavor and aroma. THC content 19%. CBD level – Low. Flowering Time 56 days. Yield – 150 grams per square meter. Buy OG Kush Feminized Auto Flowering Marijuana Seeds. Strong, pungent aroma, dense buds and that unique skunk flavor. THC content 14%. CBD level – Low. Flowering Time 48 days. Yield – 140 grams per square meter. Buy Super Skunk Feminized Auto Flowering Marijuana Seeds. Fast and easy to grow medicinal strain with large, dense buds. THC content 18%. CBD level – Low. Flowering Time 60 days. Yield – 120 grams per square meter. Buy White Widow Feminized Auto Flowering Marijuana Seeds. With a wide choice of the highest quality feminized auto flowering marijuana seeds available, choose your favorite strain and learn more. All our seeds are dispatched directly by I Love Growing Marijuana, one of the world’s leading producers and suppliers of high quality marijuana and cannabis seeds. Enjoy the very best stealth postage and packaging techniques included in the price, as well as the assurance that each and every purchase is completely guaranteed to arrive, or replacements will be dispatched free of charge, and as soon as possible. With a variety of payment options, all totally secure and encrypted, pay by card, bank transfer, cash or even Bitcoin and buy the best feminized auto flowering marijuana seeds available online. 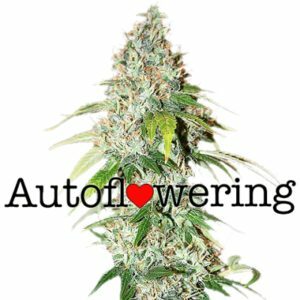 Not Sure Which Auto Flowering Seeds To Buy? We offer two different mixed packs, each containing three different feminized auto flowering marijuana seeds in each packet. Choose from packs with 3, 5 and 10 of each seed, making a total of 9, 15 and 30 seeds per pack which offers great savings and variety. 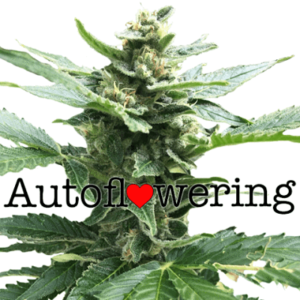 Click below and choose your favorite auto flowering marijuana seeds pack. guaranteed shipping to all parts of the USA. The rise in demand to buy feminized auto flowering seeds during the first few months of year can often be attributed to growers looking to produce an early outdoor harvest. Easy to grow, feminized auto flowering seeds require little skill or previous knowledge, and are often referred to as ‘Throw and Grow’ seeds due to their speed and natural ability to grow and flower under almost any conditions. Demand for high quality feminized auto flowering seeds has grown substantially over the last decade, as more and more people discover just how easy it can be to grow your own marijuana outdoors using feminized auto flowering seeds. With very little effort, a high quality crop can be harvested within 70 days from the seeds sprouting, making them an ideal choice to cultivate outdoors from early Spring, through to the Fall. Until the early 1980’s cannabis and marijuana seeds were sold in packets often referred to as Regular marijuana seeds. As marijuana seeds are deciduous, either male or female, there was no guarantee how many males or female seeds were contained in each packet. The genetic work carried out originally by a handful of cannabis horticulturalists during this time found a way to remove the unwanted male chromosomes from each seed, guaranteeing they generated female-only plants, these were called feminized seeds, and have become the most popular and accepted way to buy and grow cannabis and marijuana seeds. During the 1990’s cross-breeding with a wild form of self-flowering marijuana known as Ruderalis, began to produce strains that had the ability to grow and flower regardless of the number of light hours they received. 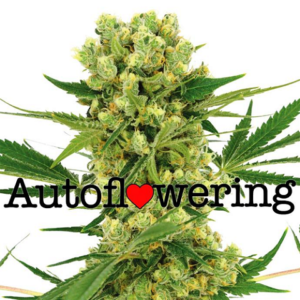 These were called auto flowering seeds, and although they produced both small yields and male/ female plants, the beginnings of a new type of marijuana plant began to emerge. With little demand for any form of male cannabis plant, feminized auto flowering seeds were quickly developed, guaranteeing pure, female-only plants. Cross-breeding with strong, stable strains has produced reliable and repeatable results, with a selection of different feminized auto flowering seeds for sale, all guaranteed to produce female plants. Are All Feminized Auto Flowering Seeds The Same? 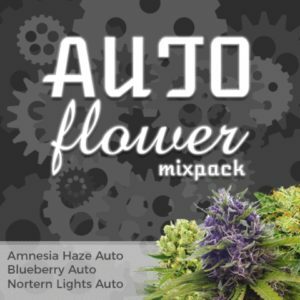 We offer a selection of feminized auto flowering seeds, each with its own unique characteristics. While all feminized auto flowering seeds are guaranteed to germinate, creating a self-flowering, pure female marijuana plant, their flavor, aroma and effects can differ greatly. Only a small part of their genetics is supplied from its Ruderalis parentage, with the majority coming from the feminized parent. This has allowed for the creation of many popular and stable strains to be created as feminized auto flowering seeds, with similar tastes, aromas and effects as their traditional feminized counter-parts. With a variety of strains available, choose from the fast-flowering Auto Super Skunk or Auto Cheese varieties, or perhaps a fruity Blueberry or Bubblegum are more to your liking. Each strain offers different flavors and effects, and with feminized auto flowering seeds maturing in under 70 days from sprouting, you won’t have to wait long to sample the fruits of your growing efforts. You can buy feminized auto flowering seeds through us and enjoy free, guaranteed shipping to all parts of the USA. Using the very best ‘stealth’ shipping methods, all purchases are dispatched directly from I Love Growing Marijuana, one of the leading producers of high quality marijuana seeds, and are guaranteed to arrive, or replacements will be shipped totally free of charge. Available in a variety of pack sizes, and as variety mixed packets and complete grow kits, we offer a wide selection of the best feminized auto flowering seeds available. All sold with guaranteed germination and their ability to create a high quality, female-only automatic flowering marijuana plant. An ideal choice for all types of outdoor grower, feminized auto flowering seeds are the fastest and easiest way to grow your own marijuana, click through your favorite strains and learn more.